Messaging apps are everywhere: What goes into building a great messaging app? Messaging is one of the important functions of smartphones, which people love to use the most. Whether it is texting on WhatsApp or WeChat or Viber– users always want to have them at hand. It is estimated that by the end of 2020, nearly 30 trillion messages will be sent. The mobile app industry gets more and more competitive with time. Users no longer want to pay SMS charges for sending text messages. They prefer something that work over cellular network or Wi-Fi. With so many players like WhatsApp, Viber, Hike and SnapChat – it is difficult for developers to come up with a new Messaging App that attract large groups. However, there are still many opportunities to create a great messaging app. All you need is a unique idea, innovative concept and strong development team. Now, do you know why messaging apps are so popular? Well, Instant messaging platforms such as Yahoo Messenger, Facebook Messenger and Google Hangouts have boosted the excitement of internet community. Though these platforms had some drawbacks initially, they were improved and attracted more users. If we compare today’s popular Messaging Apps – their impressive design and technology has dominated the internet messengers. The features of messaging apps such as –profile description, reasonable pricing, self-expression, customization, design etc are the reasons behind their increasing popularity. Messaging apps has changed the way people communicate with each other. It is a good opportunity for entrepreneurs and app developers to introduce the next big thing in the market of instant messaging. Messaging apps are no longer used for texting or sending pictures. Companies are figuring out new ways of marketing and using messaging apps in this regard. The most successful messaging apps are almost installed in every smartphone and are earning millions of dollars. Let’s have a look at some of the popular messaging apps and their features. Well, WhatsApp brought a revolutionary change in mobile messaging. When it was created in 2009, people used to use Skype for instant messaging and video calling. However, due to the fast pace of mobile app development – people expected new messaging apps that are cost-effective and easier to use. The best thing about WhatsApp is that it operates through the best protocol to manage unlimited number of contacts and high file transfer rate. In short, users can transfer files, images, video and audio seamlessly. Telegram, launched in 2013 has already 200 million users. Experts believe that the success of Telegram lies in MTProto protocol that ensures high speed and security. The key feature of Telegram is that users can start a ‘secret chat’ with anyone they wish, without leaving any trace on company’s server. The best thing about this app is that here are no advertisements. Users can express themselves with the help of self-made stickers to make the conversation more personalized. Hike is an instant messaging service for smartphones that was launched in 2012. It was a joint venture between Softbank and Bharti Enterprise and reached the valuation of $1.4 billion. This app was initially launched for free text messaging across India. However, it was revamped with various chat themes, chat stickers, hidden chants and many other features. Hike is one of the top messaging apps on iOS, Android and Window store in India. It is estimates that Hike crosses over 40 million users worldwide in no time. Though WhatsApp is dominating the global message market, we see a lot of people switching to Hike for ultimate experience. There are lots of unique features in Hike that make you try it atleast once. How to make a messaging app? Messaging app can be created from the scratch as well as by using online tools, protocols and APIs. If you want to outsource it, you should delegate the task to a reliable app development company, like Promatics Technologies. Your main consideration should be – selecting the right platform, core functionality of the app, design, and data transferring method. Besides this, you should take a look at the features that make a great messaging app. 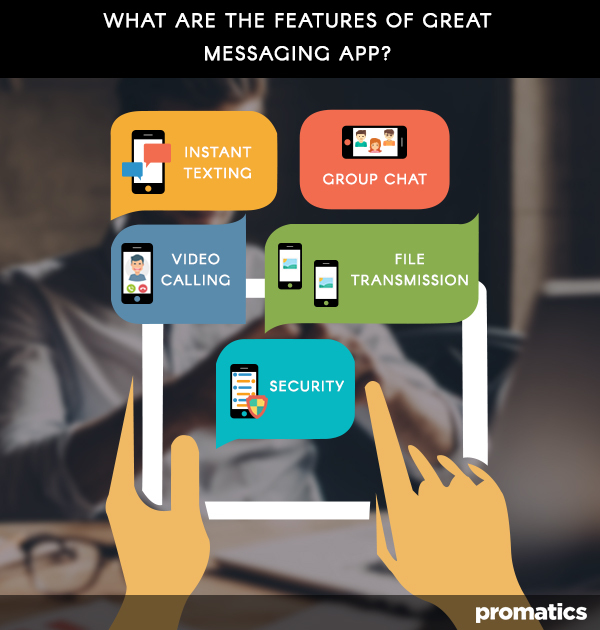 What are the features of great messaging app? With the increasing demand of instant messaging apps, it has become difficult for developers to meet the ever changing need of users. People are in search of the messaging apps with best features and cost-effective solutions. If you want to develop a great messaging app, you should make it feature-rich. Each successful feature of your app can attract new users. Here are some of the must have features in a messaging app that makes it stand out of other apps. Instant messaging is one of the must have features of messaging apps. The app should be operable through cellular network or Wi-Fi. Even if the user goes offline, they should be able to receive back the notifications when they are online. The messaging app should also have stickers, custom fonts, emoji’s, group chat, mute chat and other features. The messaging app should support multi-media file transfer in real time. Users love sharing different types of images, videos, audio, GIFs, stickers and documents. The efficiency of the messaging app can be maximized by allowing sync service with popular cloud services. Security is another essential and must have feature of messaging app. It is crucial to keep the data of users safe and secured from others. Users are always concerned about the private data going public and hence security should be prioritized. Mobile app developers can invest in premium encryption to provide high level data security. The quick search and group chat feature will help users to connect with other users through group conversation. The users should be able to search and track conversations with ease. This feature is useful for professionals where important details are shared within a conversation. Skype, the popular instant messenger has brought a revolutionary change in the way people used to make international calls. Taking instant messaging to next level, you can incorporate audio and video call feature in your app. Make your messaging app interactive without putting any limits on the way people interact with each other. Besides these, the messaging app must be integrated with geolocation feature that allow users to share the location. Push notifications, cloud service synchronization, messages broadcasting etc can make the app successful. Implement some killer features that can lead to the success of your app. For example – Snapchat has a killer feature that allows users to share an image or video that can be viewed for few seconds. This feature attracted young audience from across the world and made it highly successful. I hope you now know how to create a great messaging app and what all features it must have. People always seek a fully customizable messaging app that allows them to express themselves in a different way. There is a bright future for messaging apps, as millions of users from across the world are using them on a daily basis.The future of messaging apps made it clear why they are so popular. Despite of huge competition, there is always space for new messaging apps. We at Promatics technologies take pride in providing the best mobile app development solution. If you want us to create the most advanced messaging app, contact us today!